Our board 1 GM Jason Bokar just agreed to a draw in his final game vs. our friend and fellow USA resident GM Ian Brooks of England to finish his playing schedule. Jason said, "While I still think I had some advantage, I didn't want to lose the game on some technicality as I move to France". In fact, this was the final outstanding game in the entire ICCF XVII Olympiad Preliminaries, Section 3, so this event is now finished. The entire USA team worked very hard, straining to win every half-point we could to insure qualifying to the final. In the end we finished a full four points ahead of 3rd place Portugal. Every player made valuable contributions to the team success. In our individual team matchups (6 games vs. each of the other nine teams) we had seven wins and two ties. Our ties were against 1st place Switzerland and 3rd place Portugal. Switzerland had the same team score but edged us on game points. Every other team lost at least one team matchup. Our six team members average finishing in 3.25th place on their board with a score of 5.83-3.17 (5.83/9). On bd. 3 Rodriguez tied for 1st, on bds. 1 & 5 Bokar and Millstone tied for 2nd, and all boards finished with excellent scores and good final placings. We will be a team to be reckoned with in the Final! See the Section 3 Server Crosstable for the final team standings. Each year the Chess Journalists of America (CJA) conducts a contest for the best chess journalism published in the USA during the previous year. Currently there is only one category specifically for correspondence chess, "Category 4 ... Most Notable Achievement In Correspondence Chess". This year Alex Dunne won 1st place for his story on how the USA team qualified for the Final of the 17th Chess Olympiad. Award announcement: http://www.chessjournalism.org/aw2008.htm (see Cat. 4). Alex's prize-winning entry: "Team USA Makes Olympiad Finals" by FM Alex Dunne January 2008 Chess Life, page 18. The article is available in an on-line version at http://main.uschess.org/content/view/8099/430/, but you must be logged on at the USCF web site to access it. 19.August.2008: SIM Michael Millstone finishes with win! SIM Michael Millstone has posted his final result, a win vs. his Slovakian opponent. That finishes his playing schedule with an undefeated five wins and four draws. Michael finishes only 1/2-point behind the board 5 top score. His 7-2 result exceeds the SIM norm by half a point. Michael says, "Anybody need an extra SIM norm - I have one going cheap!" Michael's Games file has been updated with this 69-mover. This leaves only one remaining game for the USA team, which has clinched second place and qualified to the final some time ago. 13.Jan.2008: IM Keith Rodriguez Wins Final Game, Achieves First SIM Norm! Our board 3 IM Keith Rodriguez has reported another win to finish his playing schedule with an excellent and undefeated 6-3 score. This finishes all play on board 3 as well, with Keith moving to the top of his board crosstable. Congratulations on your first place finish, Keith! This win had another special significance in that Keith has now obtained his first SIM title norm! Keith's opponent recognized the inevitable in a difficult looking R&P vs. R ending and resigned. Endgame tablebases indicate the win. See ICCF Game Page for the final position, or see the entire game at Keith's Games replay page. This moves the team score to 33½ - 18½. It looks like the team will finish just out of first place but our very solid second place score insures our qualification to the Olympiad Final. Go Team! The Chess Life article by USCF cc Director Alex Dunne mentioned below is now available on-line at the USCF web site. See: Team USA Makes Olympiad Finals. 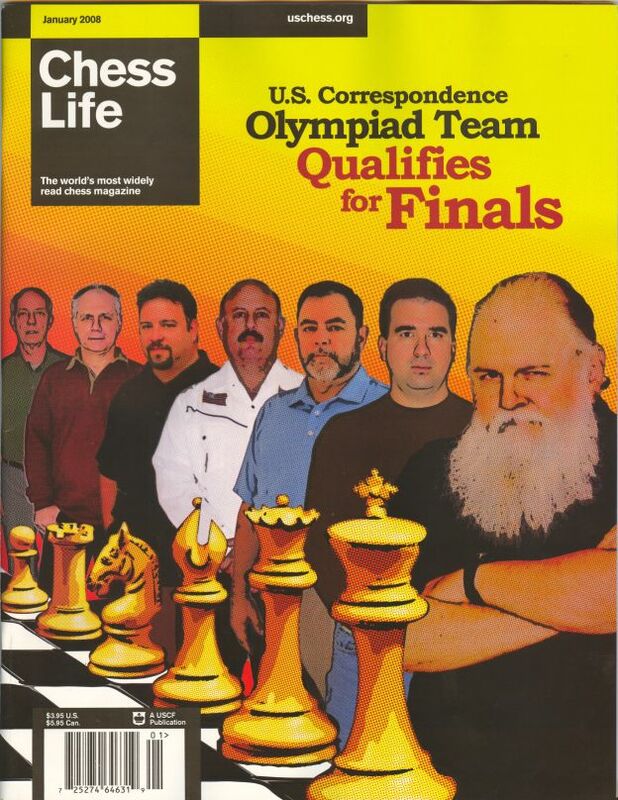 28.December.2007: USA Team on Chess Life cover for January 2008! Thanks to Joan DuBois (USCF Director of: Communications, Affiliate Relations & Correspondence Chess) for giving us an early look at the upcoming cover for the January 2008 issue of Chess Life magazine, which will have a feature article about the USA team. This team portrait, created by USCF Art Director Frankie Butler from individual photos provided by team members, shows (left to right) the team players IM Corky Schakel, IM Robert Rizzo, GM Jason Bokar, SIM Michael Millstone, IM Keith Rodriguez, SIM Ken Reinhart and team captain IA Franklin Campbell. This team means business! 5.December.2007: Team USA Advances to 17th Olympiad Final! Two new results have catapulted the USA team into the Final. Although it was just a mathematical chance and not realistic considering the game positions, Portugal still on paper had a chance to overtake USA for the final qualifying spot (all other teams had already been eliminated), but now that tiny glimmer of hope for them has vanished with these new results. USA qualifies to the final with three games remaining (the final team score will certainly increase). Congratulations to GM Bokar on his sparkling win over his SIM opponent. His Games page has been updated with this impressive win. Some of Jason's comments on this game: "... this game follows a very critical game in this variation - one proposed by Arno Nickel in his match against computer Hydra. I think with a "human mind" you can see white was doing better, and I feel quite good that I won this game, though I do feel that Black had some chances to equalize in a very complicated game - though I also feel white has the more optimistic chances (and choices at each move during the game). See this link for a lot of analysis: http://amici.iccf.com/issues/issue_05/issue_05_hydra_nickel.html." IM Rizzo was very close to the win, but his half point absolutely clinches the USA qualifying spot in the final. To see how he made his opponent work very hard to eek out the draw see Bob's Games page. 20.November.2007: IM Corky Schakel has updated his on-going stats page again with the following comments. "Things are finally slowing down a little after the trip to Spain [Cork was at the annual ICCF Congress -- JFC], so here is the OLY17 worksheet. We all know that we need one point in five games to clinch, or have POR lose their last game, so it's academic. Cheers! Cork"
See Corky Schakel's updated team scores. Since there are 54 games per team we can observe the following from Cork's table. Switzerland has finished their playing schedule in first place. The recently finished annual ICCF Congress in Spain has confirmed the following new titles for USA players. Congratulations to our teammates on Board 1 GM Jason Bokar and Board 2 SIM Ken Reinhart on their well-deserved titles! Their entries on the player profiles page have been updated. Every member of the USA team now has a title! Michael Millstone has now submitted his photos to the CL Art Director Frankie Butler using an on-line photo album to do the job. Two of the photos were copied from this album to display with the samples from Keith Rodriguez. 7.October.2007: USA Board 1 Jason Bokar Earns GM Title! Congratulations to the USA Bd. 1 Dr. Jason Bokar on qualifying for the ICCF Grandmaster title! Just in from the ICCF Qualifications Commissioner Eric Ruch: "I confirm the GM title of Dr. Jason Bokar. Congratulations!" With a little luck Jason will receive his medal and certificate from the ICCF Congress meeting later this month in Spain. Early next year Chess Life will have an article about the USA 17th Olympiad Preliminary Team. The CL Art Director Frankie Butler has given instructions on the types of photos she needs for composing the cover shot. She was very happy with the photos provided by team member Keith Rodriguez, so they are now on display (in smaller size) as samples for the other team members to use as a model. 6.August.2007: IM Corky Schakel has updated his on-going stats page again with the following comments. "Two points in our five remaining games clinches, unless POR scores less than 2/2. We're in. Cheers! Cork"
Congratulations to our board 2 Kenneth M. Reinhart on completing his playing schedule on a difficult high board with a very nice 5½-3½ score and achieving his second SIM norm! This final game was a rare loss by Ken, which is a tribute to his opponent SIM Timur Balabaev, who now has a chance of winning the board prize. Ken wrote, "... Given the positions on our remaining boards I felt at last I could resign my last game. I had hoped for a week or so that my opponent would trade Queens too early and give me a reason to play on in the theoretically interesting ending with a, b, and c pawns against Knight and doubled c-pawns...clearly a loss if the White pawns are not doubled, drawing chances against only one c-pawn, so maybe not too embarrassing to keep playing in a team event? But he was too accurate. My 14...e5?! was a good idea against the f4 concept (which usually leads to a very closed, even, dull game) but I executed wrongly, it has since been played a few moves later with good results. This should have been a draw but I could taste that GM norm and played risky in a lot of games. This is my first real loss ever in ICCF play, but since it comes with my second SM norm and while we are clinching a spot in the Final I guess it's all right. ..."
All right, indeed! Ken finished with an excellent score, helping the team qualify for the final and missing the GM norm by a single point (while achieving the SIM norm). This interesting game has been added to Ken's Games page. Note that the USA team hasn't technically clinched 2nd place and a spot in the final, but we are confident and it's just a matter of time now. Go team! 22.June.2007: IM Corky Schakel has returned from Alaska and updated his on-going stats page. See Corky Schakel's updated team scores. Switzerland is destined for first place and five teams are mathematically eliminated from catching the USA, leaving three other teams with theoretical chances to take 2nd place (SVK, ENG, POR). SVK has the largest potential score of 33.5 points if they can win their final 8 games. That means USA (31-17) can clinch second place and qualification to the final by scoring 3 points in our final six games, even if our competitors win all their final games. Things are certainly looking good for USA! This is an important victory for USA against one of our chief rivals for a qualifying spot. Cork's Games page has been updated. Cork's Team Standings has been updated. Corky says, "Hi Franklin, We are unstoppable..." He's right, of course. Our board 1 has chalked up another team win vs. Kazakstan! With the USA going to +13 and Kazakstan to -3 they have been all but eliminated. We are 3-1 vs. KAZ. In fact, in our nine team matchups we have clinched a tie or win vs. every other team except England, where we are currently 2-2. Four of our nine competitors have been mathematically eliminated from catching us: Slovenia, Iceland, Chile and Nicaragua. With only seven games remaining for USA we are just where we want to be to claim a qualifying position into the final. Jason's Games page has been updated. Our board 3 has kindly supplied annotations to his recent win over GM Farit Gasisovich Balabaev (KAZ). See the last game in Keith's Games file for his commentary on this significant team win. In remarkably similar circumstances the USA picked up two more points when opponents chose to let their clocks run out rather than battle on in inferior positions when losses seemed the likely outcome. Thus both Keith and Bob have chalked up two more points for the team and moved us two steps closer to qualification to the final! Congratulations on the wins and to the entire USA team for its excellent results to date. Keith's Games file has been updated. Bob's Games file has been updated. If you check the crosstables don't be alarmed to see Bob's win recorded as a loss. This was a mistake by the TD which should be corrected quite soon. Once we get that extra point added the USA team will take its place at the top of the table with 29 points! Switzerland is still favored to move into first place but USA appears ready to qualify to the Final. We have just eight games remaining, though not one of our six players has finished his schedule. I anticipate a big celebration in the near future! It's interesting to note that with eight games remaining the USA team has already clinched a plus score. Also, it appears the USA won't lose a single team match against any of the nine opponent teams. Only England (USA-2 ENG-2) and Kazakstan (USA-2 KAZ-1) still have a theoretical chance to beat the USA, but my opinion is this won't happen. Unfortunately, the "Team Score" in the server crosstables are not calculated correctly (used only to break ties for qualification to the final) but the USA team appears headed for a strong score. Another result is in for SIM Michael Millstone, a draw with his opponent from Kazakstan. Michael now stands 6-2 with one game remaining against Slovakia. Three USA players are now down to their final game, including Board 2 Ken Reinhart (vs. KAZ) and Board 6 IM Corky Schakel (vs. ENG). The team score moves to 27-17 with 10 games remaining. Michael's Games file has been updated. Corky Schakel's team standings has also been updated. Congratulations to SIM Michael Millstone on another win, extending his personal record on board 5 to an outstanding 5½ - 1½ (two games remaining). This moves USA to 3rd place on the server crosstable just 1/2 point behind the leaders. However, USA has 11 games remaining while the leaders have far fewer (1 for Slovenia and 6 for Portugal). Of course, Switzerland has a bunch of remaining game and is a favorite to take 1st place, but USA is doing what is required to take that second spot and advance to the OLY17 Final, thanks to games like Michael's latest win. Michael's Games file has been updated. 5.April.2007: IM Corky Schakel has updated his on-going stats page again with several new results showing a close race for the top four positions. See Corky Schakel's updated team scores. If we stick to our program and finished as we expect we should do well. 24.Mar.2007: IM Corky Schakel has updated his on-going stats page with the latest results. See Corky Schakel's updated team scores. His page is updated from time to time without an announcement here, but the latest update date is always listed next to the link to his stats page in the list of links above. 19.Feb.2007: IM Corky Schakel has updated his on-going stats page with the latest results. See Corky Schakel's updated team scores. At the moment the USA has taken a tiny first place lead! Congratulations to Ken Reinhart on achieving both an IM norm and a SIM norm on board 2! I have applied to the TD Cecilio Hernáez Fernández to confirm these norms to the ICCF-U.S. Secretary, represented by Ruth Ann Fay. Combining these norms with Ken's achievement in the XV Anniversary of FECAP (Cuba) - Group A he can expect to receive both the IM and SIM titles at the next ICCF Congress in Benalmadena (Malaga), Spain in October 2007. He is minus a game or two, but his norm in FECAP would stand if he had played the additional games (and lost them), so it seems likely Ken's norms will be sufficient. 19.Feb.2007: Ken Reinhart continues his rampage through board 2! Our board 2 has completed his expected win over his Nicaraguan opponent with resignation coming shortly before Ken's creation of a new Queen and rapid mate. Ken's score goes to 5½-2½ while the team moves back to +9 and continues on-track for a solid finish. Congratulations to Ken and to the entire team! For his latest win see Ken's Games page. 8.Feb.2007: Our board 4 IM Robert Rizzo has finished his game vs. Portugal, finally absorbing a long-expected loss. However, Bob gave it a real team try and fought till the end was no longer in any doubt. We have a real fighting team combined with strong chess skills and devotion to the team concept. With this combination of traits our advance to the final seems certain. We still have an excellent +8 score with some certain wins on the way. The game has been added to IM Robert Rizzo's Games page. 27.Jan.2007: Our board 4 IM Robert Rizzo has finished another game, a useful draw vs. England. That gives the team a 24½-15½ score with 3 games remaining for Bob and 14 games remaining for the team. It moves the USA team ½ point closer to qualifying to the Final. Good work, Bob! 24.Jan.2007: Our board 4 IM Robert Rizzo writes, "After looking at this game again I found a hole in my analysis - in the one line that I thought was promising. Thus seeing nothing better than a long protracted even battle, I have decided to take the Hippocratic approach - "First do no harm". So I have agreed to a draw with my strong Swiss opponent. The fact that I am black and outrated by over 100 points helps to rationalize my decision." This moves our team score to 24-15, a strong +9. Nice, Bob. The Swiss need some full points. This draw takes us one step closer to qualification! 13.Jan.2007: Our board 3 IM Keith Rodriguez has reported a huge win over the team that PREVIOUSLY led the competition! This slides us right into first place. Kudos to Keith on this important and impressive win. Check out how he finished off his 2500+ opponent from Slovakia. Congratulations on this big win, Keith ... excellent! The game is now on Keith's replay page for your viewing pleasure. See Games page. Note: Cork's team standings table has been updated again. "Look at those percentages: 60.8 vs. 60.7 for second. I wish it were over! 12.Jan.2007: SIM Michael Millstone wins again! Apparently Michael's opponent cracked under the strain of being down an exchange for a pawn and exceeded 40 days without making a move (he's making moves in other games). After application by the team captain the TD awarded the full point and the USA team score pushed up to +8 at 22½ - 14½. Congratulations on a super score, Michael. At +3 =3 -0 Michael is one of the stars of the team! "Slovenia just grabbed a bunch of points on Bd. 6, but they are not in the race (although leading in points). 3.Jan.2007: SIM Michael Millstone reports another result, a draw with Black against England. 16.12.2006: IM Michael Millstone wins! My opponent from Slovenia just resigned - chalk up another win for team USA!. This gives Michael an excellent two wins and two draws for a score of 3-1 so far. It also pushes our team to +7, just behind Slovakia at +8 and just ahead of Switzerland at +6 (though they have finished nine fewer games). It looks like a very close race for the top two qualifying positions, but the USA is well positioned and will challenge for a top spot. Michael's Games file has been updated. Cork's team standings has also been updated by Cork. 4.12.2006: Ken Reinhart posts another win! Our board 2 has a new win, this one against one of our chief rivals Slovakia. This gives Ken a current undefeated score of 4½-2½ with two remaining games. Our team score goes to +6 at 20-14, keeping us among the leaders. For his latest win (with light notes) see Ken's Games page. 21.11.2006: IM Michael Millstone has reported a draw on board 5 against his Portuguese opponent Carlos Salvador Marques. Check the game out in his Games file. While our recent draws haven't increased our plus score, they also haven't decreased it. We definitely have some wins coming, and avoiding losses is an important part of our success. 31.10.2006: Our board 1 SIM Jason Bokar has drawn with Black in two games versus. his Slovenian opponent Leon Krajnc and his Chilean opponent GM Guillermo F. Toro Solís de Ovando. 26.10.2006: Ken Reinhart on board 2 has reported a draw with Portugal. Ken's game replay page has been updated. See Games page. I'll update Cork's standings page when I has a chance to make the adjustments. 23.10.2006: Congratulations to our teammate Michael Millstone on achieving the Senior International Master (SIM) title. The award was formally made during the recent ICCF Congress in Dresden, Germany. You can find a complete list of new title holders in the first draft of the Congress minutes. 22.10.2006: Our board 4 IM Robert Rizzo writes, "I have just agreed to a draw with Janko Bohak (Slovenia)." This bumps up the team score to 16½ - 11½. I have also added a popup window with Corky Schakel's updated team scores. Thanks, Cork! 11.10.2006: Our board 4 IM Robert Rizzo has reported his third result, a 40-move draw vs. Chile. This brings the team to the half-way point with 27 results out of 54 total games. Six team wins vs. only a single loss is a great first half. The expectation is for a slightly better second half. 10.10.2006: Our board 1 SIM Jason Bokar has another solid result, a draw against his Swiss GM opponent Bela Toth, who is the rating leader on board 1 and the only player there to have a win so far. 22 of the 45 games on board 1 have finished, with 21 draws recorded. It looks like board 1 is going to have a tight finish. Jason's Games page has been updated. USA and Switzerland remain at +5. Our board 6 IM Corky Schakel has chalked up another full point to push his record to 5½-2½ with one remaining game (and he has an edge in that game as well!). Go Cork! Go USA!! This is an extremely entertaining game that you should find worthwhile playing over. Cork plays an aggressive opening, wins a pawn, gradually increases his material advantage (four pawn advantage by the end) and forces his opponent to back down time and again to avoid exchanges that would make the win easy. Instead, the opponent is given no chances to complicate things and Cork converts a clearly won game in a textbook fashion. Well played! You can see this game by going to the board 6 crosstable (you can play it out via "live" display or download the PGN file) or checking out Cork's updated Games page. Remaining teams at or below 50%. 24.09.2006: Our board 4 IM Robert Rizzo has reported a draw with the black pieces against his Slovakian opponent Dr. Daniel Povchanic (2471). IM Rizzo reported, "I have agreed to a draw with my Slovakian opponent in the Olympiad prelim. I sat on this decision for almost 3 weeks but could not find a forcing line after hours of analysis." This result is in line with being careful not to lose anything to our chief rivals Slovakia, Switzerland and England. The game has been added to IM Robert Rizzo's Games page. 23.09.2006: USA Bd. 3 IM Keith A. Rodriguez reports a draw vs. his Nicaraguan opponent. Keith continues his solid play and predicts some good results coming in the future. Keith's Games file has been updated. "I spent some more time looking over this game and couldn't find anything so agreed to the draw. As a side note Pineda's rating is 2406 on the current ELO list. A bit stronger than his 2200 provisional." Here are the current standings, arranged by percentage. It's very close at the top. USA is the only team with +4 now, but Slovakia and Switzerland have significantly fewer results so their percentage is slightly higher. A recent surge by Portugal puts them in plus territory. We still have a number of games remaining vs. Slovakia (4 games), Switzerland (2 games) and England (4 games), so those game take on added significance. "My opponent from Chile has just resigned to give me my first win. The game is another advertisement for the Winawer over the Classical French ;-) Just kidding, but if Black plays the early ...Nb6 and Bd7 before ...c5, he should follow-through with ...a6 and an attempt to exchange on b5. That makes White play a4 earlier. As the opening developed Black prematurely played Nb6 in a main line and had trouble getting counterplay. The game was practically over at move 12." Congratulations, Ken! The USA is lookin' good. Check out Ken's Games page for this great win. 2.09.2006: USA Bd. 3 IM Keith A. Rodriguez reports a draw vs. his opponent from Slovenia and continues his solid play. On board 3 so far there have been 22 draws and only a single decisive game, which leaves Keith in a good position for a high finish on this board. Keith's Games file has been updated. A third (92/270) of the games in this event have now finished and 70 (76%) of these results are draws. This indicates to me that every win is significant and to gain a top place may require only a small plus score. So keep squeezing those games for draws and wins. England still leads with +4 while USA is tied with Slovenia and Slovakia with +3. Following is an interesting table showing decisive and drawn games by board. 18.08.2006: Another team win has been reported! Congratulations to our Board 5 IM Michael Millstone on an excellent victory. Michael said, "A rather uneventful win against my Nicaraguan opponent." However, I think Michael is being modest. In my opinion it is a beautiful and well-executed win. Check the game out in his Games file. This makes us Plus Three now! Only England at +4 has a (slightly) better plus score. Board 2 Ken Reinhart reports a draw with Black vs. his Swiss opponent GM Rolf Knobel. "... the updated results for my international e-mail invitation - XV Anniversary of FECAP (Cuba) Group A - have been posted and my first SM norm is confirmed, and with the "over-norm" (enough points for a SM norm in a 16-player event, but scored in a 14-player event) I can make the SM title with only 23 games (14+9) if I get a second norm here in the preliminaries." Congratulations, Ken! Your undefeated +5 score is outstanding and, of course, we all hope to see you score your second norm in this competition. A quick calculation indicates that 30% of all the games are now finished (81/270). Six teams are currently over 50%. Each team has a total of 54 games, so we still have 35 games remaining. At the moment it looks like England is the team to beat, but the competition remains very close. It appears that every half point could be critical in the end. 19.07.2006: Teammate wins the Jaudran B Memorial ! Congratulations to our board 4 IM Bob Rizzo on his big win in the Jacques Jaudran B Memorial tournament in a tough 15-player field. Bob finished with an undefeated score of 9½-4½, taking the title on tie-break. Bob is just one example of the strength of our team. Way to go Bob! A quick scan of the crosstable shows the competition averaged over 2400 and Bob made mincemeat of the field. If anyone else has a recent result to share with us, for our common inspiration, please send it in. In a recent email to the team I called for a goal of a +18 team score to create a great opportunity for the USA to advance to the final. This averages out to +3 per team member. Actually, I would anticipate a lower score being sufficient. I'm hoping for half our team members to score +3 and the rest to score decently, from even to +2. The important thing is that every 1/2 point is important. Whatever the score of an individual player, if he can save one bad game or squeeze out one win in a close game then that may be the score that pushes us over the top. Please don't be discouraged if +3 seems out of the question. Just concentrate on doing your best in your remaining games. We might be able to secure one of the top two spots and advance with a much more modest team score, since so far the competition seems to be very close, and a small plus may actually be enough. At any rate, we don't need to worry too much about our final score at the moment, just individual games. 18.07.2006: Cork is on a roll! Our board 6 IM Corky Schakel has scored yet another win, pushing his personal score to 4½-2½. In this game Corky Schakel grabs a small material advantage in exchange for a positional disadvantage, and then he slowly improves his position till he has a win based on his superior material. Well done, Cork! Our team score has moved to plus two now and we are on our way. See this new win on Cork's Games page. Currently the server shows the team listed by total points. Here is a listing showing the standings by +/- scores. Each team is followed by the number of games finished out of the 54 total games. 14.07.2006: Our board 6 IM Corky Schakel has scored another win, pushing his personal score and the team score to a plus. Congratulations on an excellent win, Cork!. As Cork puts it, "This is the best of my OLY17 games. Nobody wins without an opponent error, but he played tough for a long time, so it was white building slowly on small advantages ..."
This game is certainly entertaining and worth careful examination. See it on Cork's Games page. 7.06.2006: Our board 2 Ken Reinhart has reported another draw with Iceland. Slovenia has edged out slightly with an 8-6 score, the only team at +2 at the moment. 29.05.2006: Our board 4 IM Robert Rizzo has reported his first result, a draw with the black pieces against his Icelandic opponent Kári Elíson. A new on-line replay page has been created for IM Robert Rizzo Games. 27.05.2006: Our board 3 IM Keith Rodriguez has reported another draw with the black pieces against his SIM opponent from England, the second highest rated player on this board. Four games down, four draws, two highest rated opponents finished with. The game replay page for IM Keith Rodriguez has been updated. See Games page. 20.05.2006: Two more team results are in ... two more draws. On board 3 IM Keith Rodriguez has drawn his GM opponent and top seed on the board GM Dr. Christian Issler of Switzerland. On board 5 IM Michael Millstone has his first result, a draw with the top seed on his board Martin Leutwyler of Switzerland. Two number one seed players from Switzerland down! The on-line replay page for Keith Rodriguez Games has been updated. A new on-line replay page has been created for Michael Millstone Games. 17.05.2006: Our board 1 SIM Jason Bokar has reported his second result, a draw as Black vs. his opponent from Portugal. Jason's Games page has been updated. Check out the final few moves where Jason trades off the pawns to demonstrate equality. Nice! 5.05.2006: Our board 6 IM Corky Schakel has finished his 5th game, another Black result. This draw gives him an even score of 2½-2½ all with the Black pieces. Cork has only White games remaining now. The game replay page for IM Corky Schakel has been updated. See Games page. 28.04.2006: A photo of our board 2 Ken Reinhart has been added to his profile. Photographs of all team members can now be seen along with their biographical information on the team profile page. 22.04.2006: Our board 6 IM Corky Schakel has finished his 4th game, all results with Black! This draw gives him an even score of 2-2 with the Black pieces. So far none of the teams has broken out with either a big plus or a big minus score. It looks like a very competitive event up to now. 31.03.2006: Our top board SIM Jason Bokar has reported his first result, a draw in a poisoned pawn Sicilian against his Slovakian opponent. Check out the final position where the players were reduced to repeating moves. See Games page. Jason will be on official leave April 8-28, 2006. 30.03.2006: Our First Win! USA board 6 IM Corky Schakel has scored our first team win, evening up our team score at 3½ - 3½. This also gives Cork an even score after three results, all with the Black pieces. This dramatic Dutch Defense ended with our player queening a pawn with check in an overwhelming position. Congratulations on an excellent win, Cork! Check out IM Schakel's Games page for this sensational win over his Nicaraguan opponent. 10.03.2006: Our board 2 Ken Reinhart has reported his second result (draw). 6.03.2006: Our board 3 IM Keith Rodriguez has reported another quick result. In keeping with the "tradition" of the board, this result is another draw (all seven results on this board are draws so far). 5.03.2006: Our board 3 IM Keith Rodriguez has reported his first result. So far all games finished on board 3 (six results) are draws. The game replay page for IM Keith Rodriguez has been added. See Games page. 28.02.2006: Our board 6 IM Corky Schakel has scored our first team loss, allowing the rest of the team to relax and not worry about being the first to lose. No worries, Cork, we're all confident this is a temporary setback and we look forward to seeing your future wins. 24.01.2006: A second team result has been registered, a draw by our board 6 IM Corky Schakel. A game replay page has been created for IM Corky Schakel for finished games. See Games page. 16.01.2006: Our first team result is in! Ken Reinhart (bd 2) has reported a draw with his English team opponent Anthony Barnsley. A game replay page has been created for Ken Reinhart for finished games. See Games page. Iceland has registered two draws against Slovenia and Portugal for the remaining results in this section. 30.12.2005: Biographical information for Bob Rizzo have been added to the Player Profiles page. 29.12.2005: Biographical information for Ken Reinhart and a new photo of Bob Rizzo have been added to the Player Profiles page. 24.12.2005: This team web site is officially launched, though not yet complete. Player profiles and photos are provided for two of our players (Board 1: SIM Jason Bokar and Board 3: IM Keith Rodriguez) plus the team captain. Links are provided to the server crosstable for our section and the playing rules. Addendum: IM Corky Schakel also added to player profiles and SIM Jason Bokar profile updated. 19.12.2005: ICCF Title Tournaments Commissioner J. Daniel Finkelstein has announced the team line-ups of the prelims divided into five sections. The USA team is in section 3 with the team line-up shown at the right with the average ratings for each team. The USA is the 4th seed by rating. The top two teams qualify to the final, along with the top three finishers from the previous final (teams not yet determined). Ties for qualifying positions will be broken according to Section 5.3 of the ICCF Tournament Rules. tie breaking on the basis of team results (2 additional points for a won match, 1 additional point for a drawn match). the results of the tied teams against each other. better individual result on bd.1 (following bd.2, 3 etc.). Daniel Finkelstein also provide a set of Playing Rules. 14.11.2005: Ruth Ann Fay announces team lineup for USA team. 1. SIM Jason Bokar 2571, 2. Ken Reinhart 2463, 3. IM Keith Rodriguez 2446, 4. IM Robert Rizzo 2419, 5. IM Michael Millstone 2402, 6. IM Corky Schakel 2386, Captain: J. Franklin Campbell, IA.